AirStitch | Embroidery app for iPad by BriTon Leap, Inc.
Embroidery app for iPad by BriTon Leap, Inc.
Brought to you by the creator of Designer’s Gallery and Embrilliance, AirStitch is an iPad app that let’s you download, view, convert, email, Air Print and send to DropBox embroidery designs on your iPad. 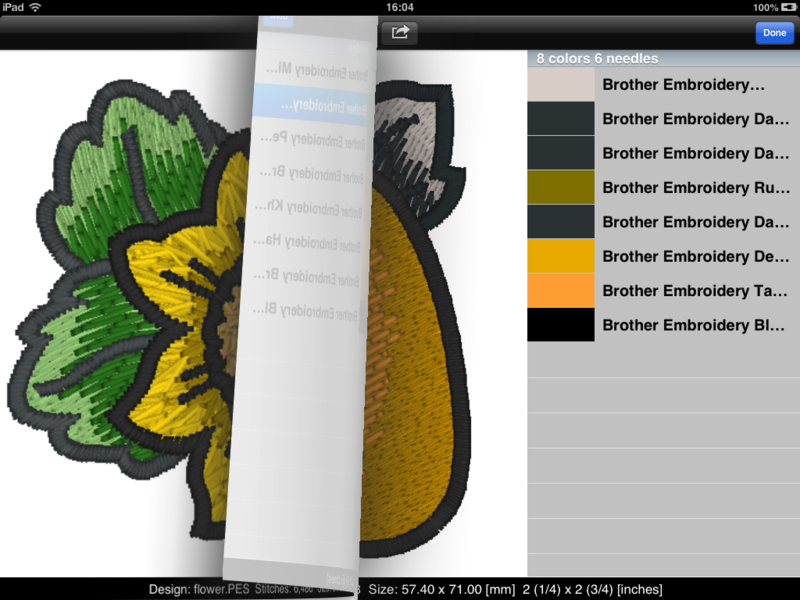 Let’s assume you like to download embroidery designs. You open a browser, typically Safari on iPad, and go to your favorite sites. There you will be able to download the designs. At this point, Safari just tucks those files away and you can never see them. 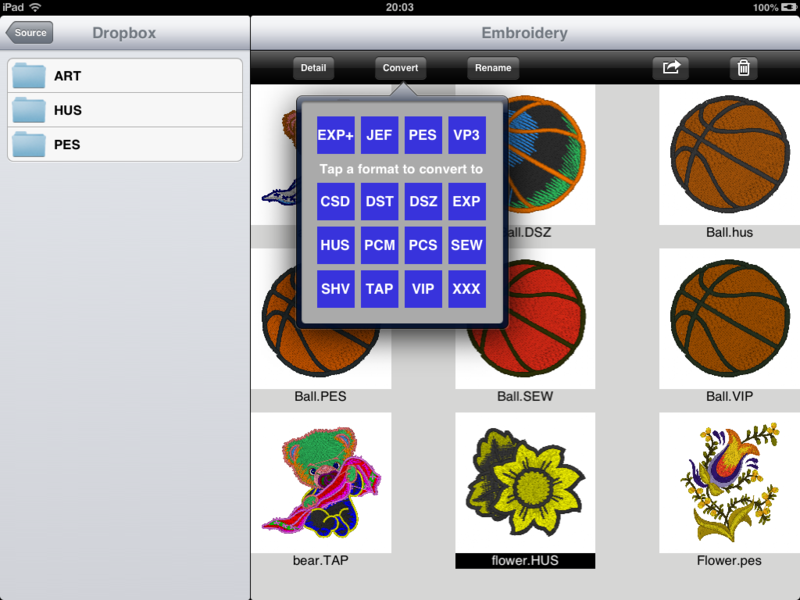 But with AirStitch installed, you are able now to Open With and choose AirStitch. 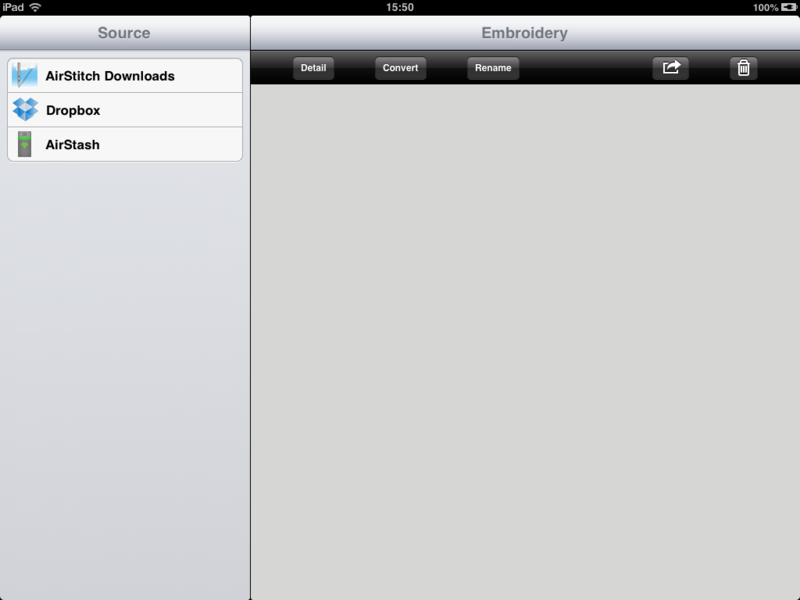 This places the downloaded designs in the AirStitch downloads folder. 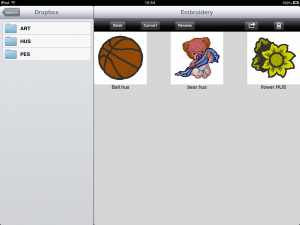 When you run AirStitch (or Safari runs it) AirStitch will unzip any embroidery designs that have been placed in its own downloads folder. 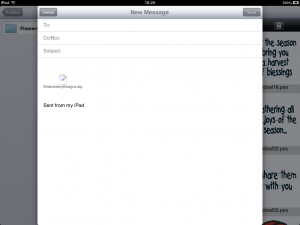 To delete a folder, swipe its name to the right, and this will expose the ‘Delete’ button. If you are a DropBox user you can also use AirStitch to view designs in DropBox and send designs to DropBox. When you open the app it will look to see if you have DropBox, and if so, it will attempt to link to it. AirStitch and DropBox are both polite so you will be asked once (you can change it later in Settings) about connecting and if you are ready to make an AirStitch folder in your DropBox. Tell it ‘Yes’ or ‘Ok’ and then you’re ready to proceed. The cool thing about DropBox is that if you have multiple computers, whatever designs you put in there will be available on all your computers. 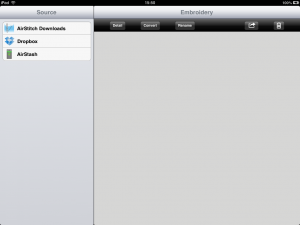 A nice feature of AirStitch is the ability to navigate folders within your AirStitch DropBox folder. On your computer you may decide to create folders within AirStitch (not the app itself yet) and the app will let you navigate those folders, convert designs in them, etc. This was a BIG bit of work, by the way, for a FREE app. Next, what if the design you downloaded is in the wrong format? But what if you want to know something about your designs? The Detail view can reveal the design in a larger 3D image, along with the color list. 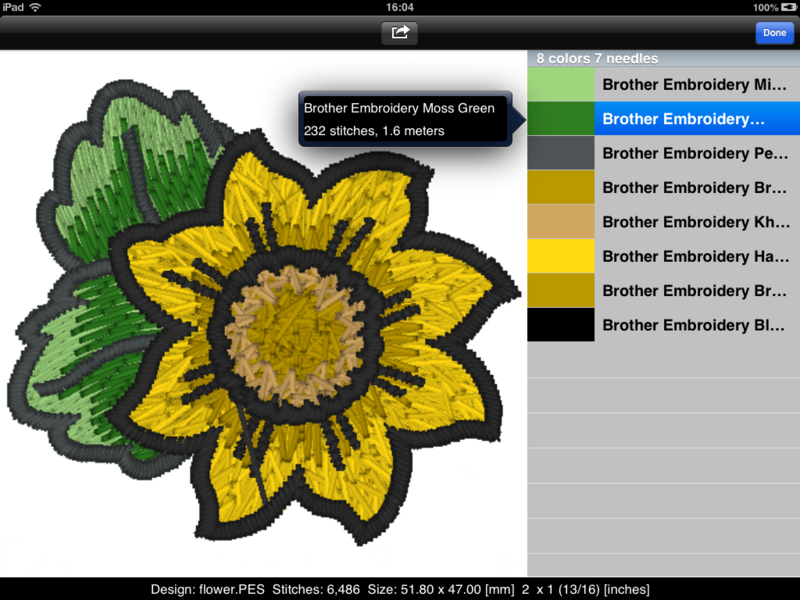 Tapping on a color shows the color information in more detail. Note that we’re not changing colors in this app yet. We had a lot to do to get it to this point! If you select multiple designs, you can simply swipe the page to scroll through them. If you want to print your designs using an AirPrint enabled printer, you can do that as well. That will get you a full-size template with an overlaid color list. Yes, we know some of you will want options on that, and we’ll get to it when we can. E-MAIL? What about that, you ask! Of course we created an email outlet so you can send designs to yourself or others (if you have permission). Note that the selected designs are .ZIP-ped for you automatically! 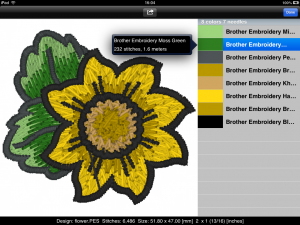 How do you get a design from an iPad directly to an embroidery machine? Well, you can go through a computer with email or DropBox, but what if you don’t want to do all that? We have been working with a company called Wearable, Inc. for two years. They make a nifty device called an AirStash. And their device is now very user-friendly with the addition of SideLink(tm) technology. Basically it is a USB stick for your designs, but it creates its own wireless network, or can join your current one. We waited a while to release a program that worked with it because they have been in constant development for several years and now have it working smoothly. We are so excited! Using AirStash and AirStitch, you can download and transfer designs, then sew them, all directly from your iPad, without the use of a computer! To use AirStash in SideLink(tm) mode, use the AirStash app and copy the SideLike URL. Then open AirStitch and click on ‘Servers’ and paste the URL. Now you can experience AirStash without the hassle of switching networks. If you are using AirStash in a Janome-based machine, format the AirStash in the machine to create the folder structure. Then when you transfer designs to the device, AirStitch will look for the usual Janome folders (usually named with an “F5″ for example) and the function Send To AirStash will convert and place your designs in there – you are ready to sew. Note: AirStash file names are converted to DOS-style 8.3 format for use in embroidery machines. This means your design names will look like “MYDESIGN.PES” for example. This is a technical requirement for the hardware to work. If your designs are not showing up on your machine, we suggest formatting the AirStash in a Windows PC, then it should behave. Ready to be an AirStitch user? Visit the AirStitch product page in the App Store! For related technical questions, AirStitch is FREE and therefore support is limited, however you can Contact Us if you would like. We have more work to do. Yes, we know. And maybe there will be a paid version for you uber-users. 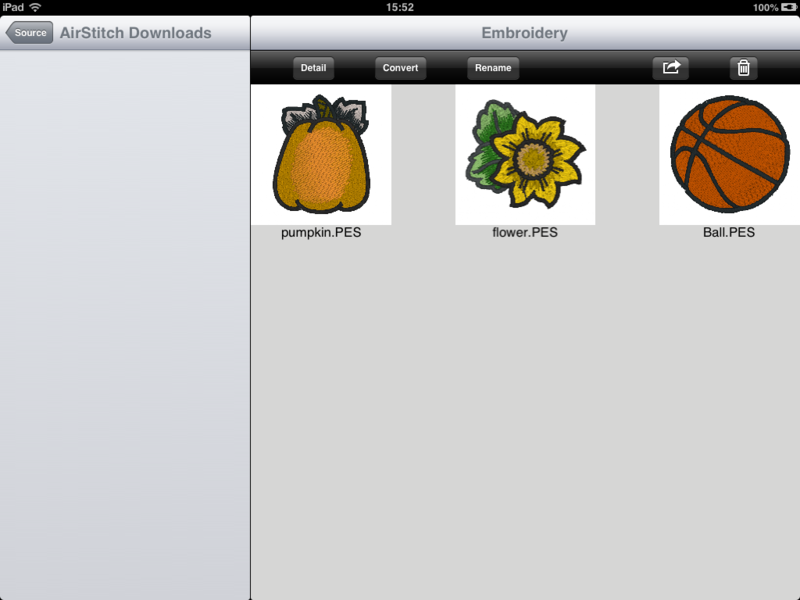 But we had to start with the basics; making an iPad useful for embroidery. So please, let us know that you’re happy with the app, but don’t send in “gee, I need the following feature…” because we are working on it already. And remember an iPad is not a computer. You have no mouse, so precision for things like digitizing and editing is limited. But if you want all that, please consider buying a copy of one of our products from Designer’s Gallery or Embrilliance. We make embroidery fun, easy and affordable. And most of our products run on Windows and Mac with one license! For the best service, visit our wonderful Designer’s Gallery dealers for any help you need with your embroidery machines and to see the full range of Designer’s Gallery software. The team at BriTon Leap, Inc.